What Type of Fireplace is Best for Your Home? With winter comes the chilling reality of cold weather. February (also known as the coldest month of the year) is looming upon us. So instead of wallowing in the winter blues, here I’ll show you the different types of fireplaces you can chose and enjoy while you’re making hot cocoa with the kids or having a wine night binge watching Netflix! First you have your traditional wood burning fireplace, this is probably the first image that comes to your head when you think of a fireplace. Although wood burning hearths require some labor, they might be considered the most romantic kind of fire with its snapping and crackling during the freezing winter nights. However, there are different types of wood burning fireplaces as there are with any kind of fireplace. Here, I will tell you about them and help you choose what kind of fireplace is best for your home or how to make the best out of the one you already have! Typically made out of stone or brick, traditional open hearths are the kind of fireplaces that create the most authentic feel. You can physically feel the heat pouring out of it and hear the crackling of a good ole wooden fire. However, they are not the most effective way of heating up your room as more modern techniques. If you do not already have a traditional open hearth in your home it will require quite a bit of construction to put in both the fireplace itself and a chimney for venting. This is the kind of fireplace that we own in our home. Rather than being open, the fire is covered with a large glass panel that enables the fire to warm up the room more efficiently rather than having all of the heat escape through the chimney. You still get the aesthetic of the fire but with more heat actually being transferred to the room! Also, this a safer option if you have small children or pets. These types of fireplaces burn gas at a cleaner rate and create heat at a lower cost. Also, if you don’t already own one in your home, they typically don’t require much construction to install, which makes them more affordable and an easier alternative to wood burning fireplaces. A direct-vented fireplace is vented through a chimney, which can be existing or a new one can be installed. However, a pipe can be used so that there are less changes to be made to the house’s structure. The flame to a gas burning fireplace is yellow, so it has a more authentic feel. Ventless build-in indoor fireplaces are the easiest to install in a home as there is no need for any venting. The flame in these types of fireplaces is typically blue and although these types of fires usually burn clean, there is still a possibility that contaminants will get in your home without the use of vents. Fireplaces that burn ethanol have become increasingly popular due to their easy installation and modern design. They are wallet-friendly and are clean and odorless. Although they probably won’t create as much heat as a wood or gas burning fireplace, they are much more environmentally friendly and come in a variety of designs. This type provides a fireplace that you can actually hang on any wall of your choosing. Providing heat and a work of art in your home, killing two birds with one stone. These also come in tabletop options, which are easily portable. You can put an ethanol burning insert in your existing fireplace if you please, making use of your existing space and its aesthetics. There are many different options available depending on whether you want to stick with a traditional look or upgrade to something more modern. 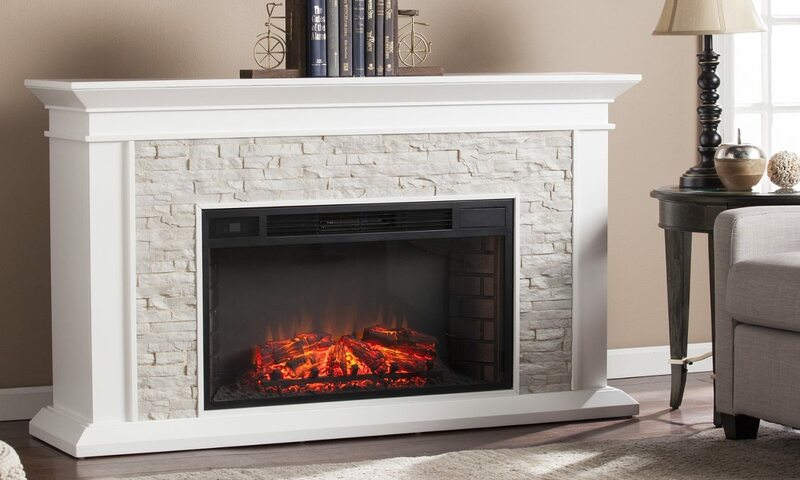 Known as the most cost effective fireplace option on the market, electric fireplaces are easy to install and super easy to use. With the press of a button, you can choose whether you want the fire on or off while maintaining a fireplace-like aesthetic. most electric fireplaces have a remote-controlled heater with different varieties of fire effects. This type of electric fireplace is meant to create the look of a wood burning fireplace. They do not require any venting or chimneys which allows you have the indulge in the elegance of a wood burning fireplace in any room of your house without having to add up the expense. Do You Have the Right Lighting?